Why do we make things? Why do we choose the emotionally and physically demanding work of bringing new objects into the world with creativity and skill? Why does it matter that we make things well? What is the nature of work? And what is the nature of a good life? Part memoir, part polemic, part philosophical reflection, this is a book about the process of creation and what it means to be a craftsman in a mass-produced world. For woodworker Peter Korn, the challenging work of bringing something new and meaningful into the world through one's own efforts is exactly what generates authenticity, meaning, and fulfilment, for which many of us yearn. 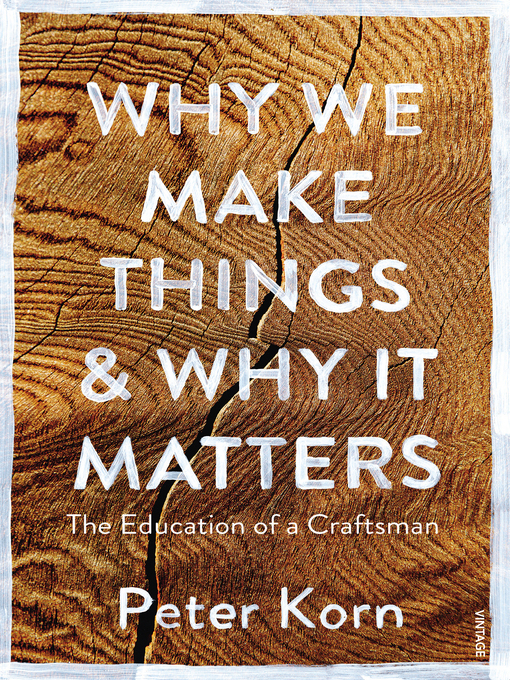 This is not a 'how-to' book in any sense, Korn wants to get at the 'why' of craft in particular, and the satisfaction of creative work in general, to understand its essential nature. How does the making of objects shape our identities? How do the products of creative work inform society? In short, what does the process of making things reveal to us about ourselves? Korn draws on four decades of hands-on experience to answer these questions eloquently in this heartfelt, personal and revealing book.